The Impending Super Solar storm! Imagine living a life today without any form of Digital Communication, no TV and radio signals and no power. Today as I was preparing to go to church, I tuned in to BBC World Service and there was a program about super solar storms. I got so interested in the topic and knowing more as soon as they hinted about the devastating effects one would cause to us if it ever occurred. A super solar storm occurs when a sizable speck of burning gas bursts off the sun. 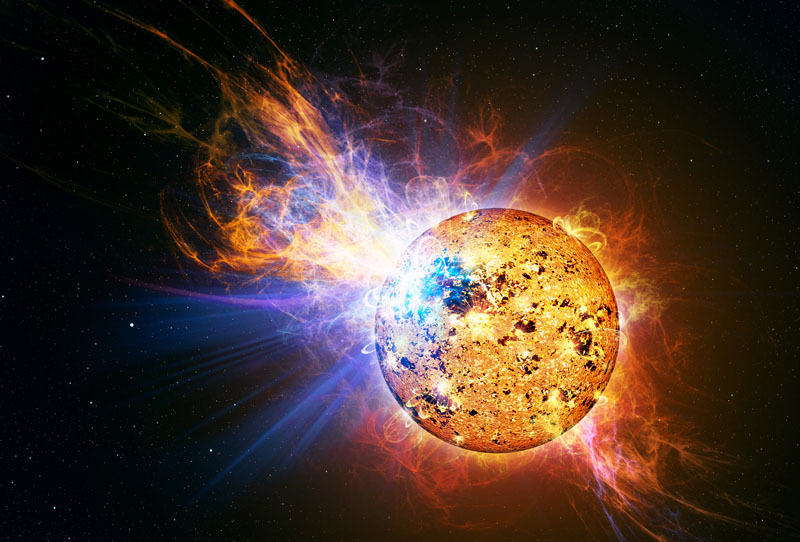 Emerging from a sunspot, a solar storm is an eruption of billions of tons of superheated electrically charged plasma that blasts out into space with a strong magnetic field. It take about 8.5 minutes to reach earth but its magnetic field which has more dire effects takes a little longer to start interacting with earth’s magnetic fields. Scientists have it that the last know super solar occurred in August 1859 and is commonly called “The Carrington Event.” The interaction between the 2 magnetic fields caused a lot of disruption to the power grids in Europe, America, China and Canada which had extensively embarked on hydro-power generation and had started to get dependent to it. This is so because the magnetic field from the storm generates an extra alternating current in the cables causing the transformers to overheat which eventually shutdown the entire power grid and the Telegraph system. This was more than 150 years ago way before all the advance technology like GPS, Satellite Telecommunication, Satellite TV and Internet. What caught my attention is that when and if the next super solar storm occurs, the world we live in today which is so dependent on technology would be completely shut down for weeks or months. This would have very calamitous effects on our way of life. Firstly, the “electricity switch” on earth would literally go off. Actually in some severe instances, whole power stations may explode. Knowing much of what we do runs almost exclusively on electricity, this would cause a lot of disruption. Even those using solar energy would not survive this. Secondly, this storm would cause a breakdown in the communication systems we have right now. What happens is, when the storm hits, nearly all satellites close to the earth would suffer power failure and eventually shut down. These satellites include telecommunication satellites, GPS satellites, Reconnaissance satellites, Remote sensing satellites and weather satellites would all suffer greatly. This would effectively mean that we would not be able to communicate via internet and telephone call. It would also mean that we would not be able to watch TV or listen to radio. Surely, this would have a very dire effect on our lives since we have made ourselves slaves to technology and electricity. Thirdly, depending on the intensity of the radiation, we may suffer a few causalities to the super solar storm. This is so because it emits lots of heat energy which may cause the temperature on earth the rise by a few degrees. This storm also comes along with dangerous radiations like Gamma rays and X-rays which may cause health risks. Using nine satellites to record activity on the sun, scientists say that observations over the last two centuries show that every 11 years the number of sun spots increases. It’s a period called the solar maximum, and it’s is expected to happen over the course of 2013. It is during this period that a solar storm is likely to happen. A lot of research is being done into minimizing the effects of Super Storms on the satellites, power utility companies are slowly waking up to this risk of solar super storms, but experts fear that not enough is being done to prepare the power grid for a worst-case scenario.